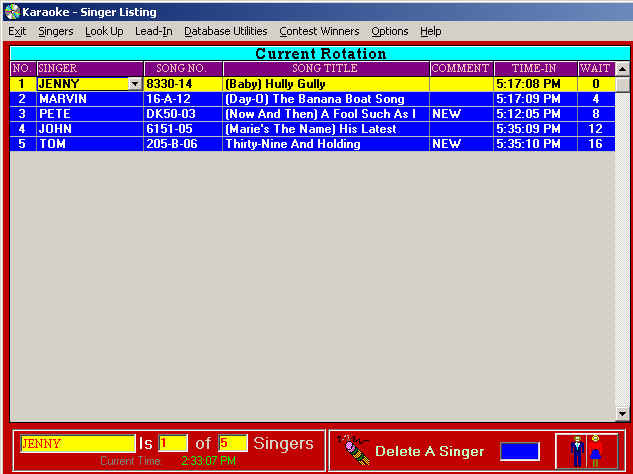 The Automated Karaoke Rotation program will do more than just keep track of your singer rotation. See some of the other key benefits you'll get from the program. Automatic Song Look-up by either Song Title, Disc Number or Artist. Track winners of contest you have and when they are eligible to enter contest again. Also set your own options for contest eligibility. Display a history of the Most Sung Song and the frequency of how many times a singer sang that song. Wait time is automatically recalculated, as you move from singer to singer in the rotation. Program comes with it's own Help screens. Lonnie of LONMAN Productions writes: "I've been using this program for 5 years now & wouldn't do another show without it. It not only has cut back on singers questioning rotation fairness, it allows them to see at a glance who is up & what everyone is singing. Love the built in song list database to view if songs are available or just as a quick reference." NOTE: This product is sold on an as is bases and comes with limited technical support.